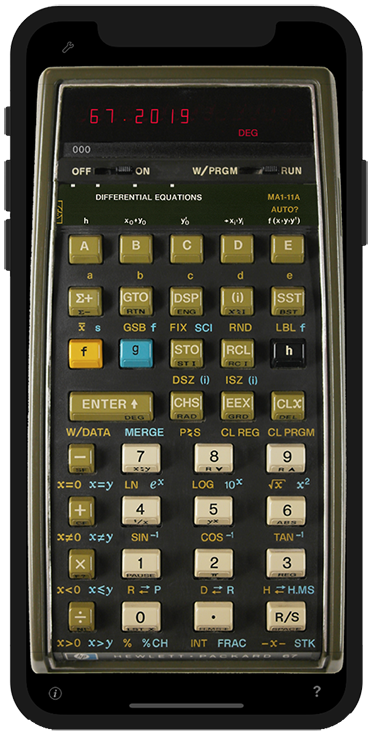 of HP-67 marketed as HP-97, as well as to RPN-67 SD for the iPhone. 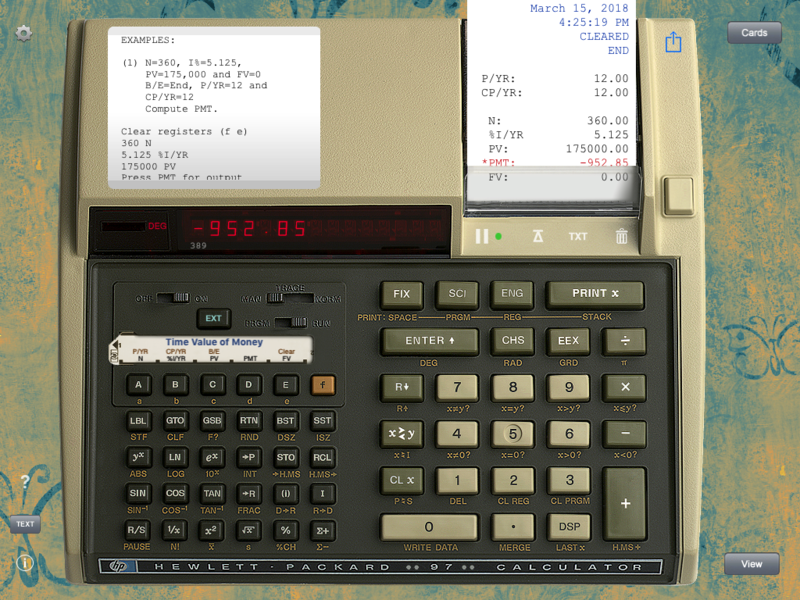 RPN-67 is a photorealistic simulation of Hewlett-Packard's second generation mag card programmable scientific hand-held calculator from 1976. Made exclusively for iPad. It comes in three versions: RPN-67 Free, RPN-67 Pro, and RPN-67 SD. 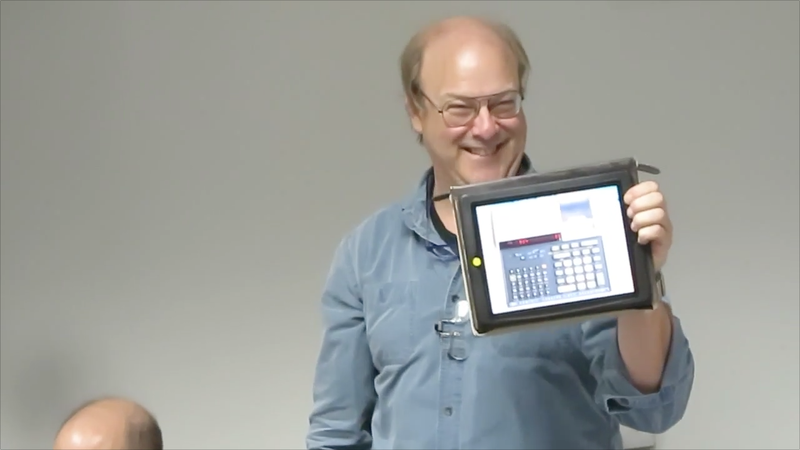 While the Free version is a capable scientific calculator sporting live register view and printing features, it lacks the programming features of the real HP-67. The Pro version adds full programmability, the ability to run virtually all existing HP-67 programs, a powerful program database, and a slew of import/export options. The SD version offers almost all of the power of RPN-67 Pro on the iPhone or iPod (see below). RPN-67 Pro is the HP-67 you wished you had back in the 70's: more program steps, more registers, more functions, more subroutine levels, much higher speed, comfortable program editing, printing without wasting paper tape, live view of all registers and flags, a program library at your fingertips. HP Standard Pac, HP Business Decisions Pac, HP Clinical Lab Pac, HP E.E. Pac I, HP Games Pac I, HP Math Pac I, HP M.E. Pac I, HP Navigation Pac I, HP Stat Pac I, HP Surveying Pac I. 100 additional registers, directly or via the I register. Full register arithmetic supported. Run programs at much higher speed than the HP-67. Or at original speed, if needed. Use virtual program and data cards. Powerful card database manager lets you organize your cards in predefined categories. Title and label your own cards right in the app, even cut off the card corners to write-protect them. Save entire card collections on your Mac or PC (using iTunes). Share program or data cards: e-mail, copy/paste, AirDrop, Dropbox, and more. E-mail program listings or print them on any AirPrint-compatible printer. Print on a virtual paper tape printer, even in colors. E-mail the paper tape, or send output to a real printer. Select any of 10 colors as default ribbon color. Perform simple curve plotting or print any text on the paper tape. Optionally show negative results in red. Follow subroutine nesting on the paper tape. See target step number of branches right in the program listing. Print label usage, status of flags, number of free program steps and more. Use geographic information from the device in your programs. Low-battery warning right in the calculator's display. Use up to 10 breakpoints with counters to debug your program. Watch the stack, all program registers, the program step counter and the flags in real-time. 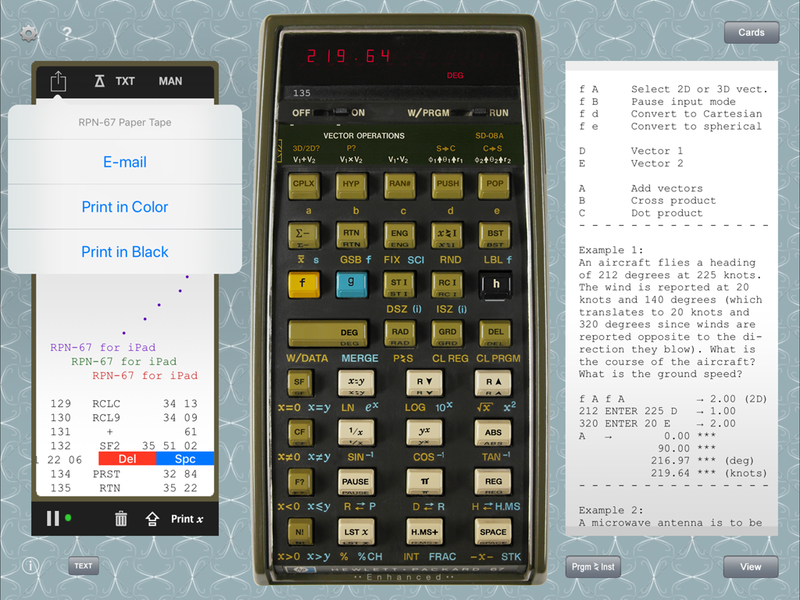 Paste text representations of HP-67 or HP-97 programs right into the calculator and run them. Copy/paste values and program steps directly in the display. Correct input typing errors by swiping left across the display. Select any of 30 background images. Or import your own. Use RPN-67 Pro like the original HP-67 by disabling all advanced features. Complex number support with 4-level stack, applicable to most functions. Change duration of the "PAUSE" command. High-precision calculations, not limited to display capacity. Country-specific thousand separators in display. Visual status indicators of prefix keys. Program steps in plain-text, right in the display area. Compress constants in programs into a single step to save memory (optional, reversible). Factorial N! accepts non-integers and negative values. Cancel SST and BST by simply dragging your finger off the key. Register arithmetic works with RCL command. HP-41-style stack arithmetic, including RCL and Exchange. Exchange x with any register, directly or indirectly. RCL ∑+ extended to STO ∑+ and full register arithmetic. Use flags 4 through 9 in the same way as flags 0 and 1. With RPN-67 Pro set to enhanced mode in the settings, the simulator offers a number powerful extensions to the regular HP-67. See section Extensions for details. New functions are mapped to the user-defined function keys A through E, as well as EEX. They may be accessed by tapping the prefix keys g or h. All functions are programmable. On RPN-97, tap the EXT key. Tap g OP (RPN-97:EXT OP) to access a menu of 100 functions you can use interactively or in your programs. Functions include equation solving, matrices, sorting, Bessel functions, linear regression and much more. Tap g CC (RPN-97:EXT CC) to access a menu of 100 constants and conversion values you can use interactively or in your programs. Where applicable, physical constants are compatible with CODATA-2014. In addition to the HP-67's regular 25 registers, you may use registers 00 through 99. Full register arithmetic is supported. You may even apply powerful operations to any range of these registers, such as sorting, averaging, copying, filling, summing, finding minimum/maximum values, and more. Extended registers may be accessed just like regular registers by prepending their address with a decimal point. STO. (i) and RCL. (i) will use the value in register I (0...99) as register address. Extended registers may be printed out by setting the paper tape printer to TRACE mode and executing the REG command. 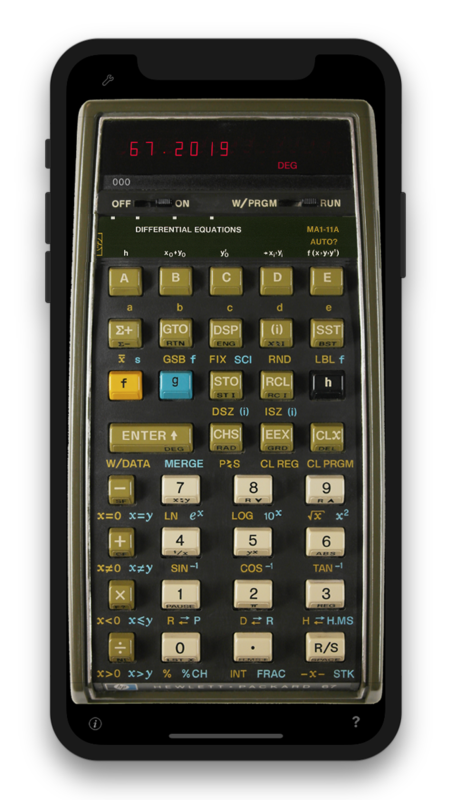 RPN-67 Pro removes the HP-67's limits on register arithmetic functions. Register arithmetic supports both STO and RCL operations and works with any register (including A...E), as well as with any stack register. The operation x≷ has been added to allow x to be exchanged, directly or indirectly, with the value of any register and also with any stack registers. The ∑+ key may be used as a dual-register address, working on X,Y and RS14,RS16 simultaneously. With 100 labels in addition to those built into HP-67, you'll probably never run out of labels again. Simply use LBL, GTO and GSB as before, but insert a "+" after the opcode, followed by a 2-digit label number, e.g. LBL+21, GTO+97. Indirect addressing works too, like GTO+(i), where register holds a value between 0 and 99. RPN-67 SD is the iPhone/iPod version of RPN-67 Pro. the features are virtually the same. Tap the "?" available on various screens for hints about using the app. HP Standard Pac, HP Math Pac I, HP Stat Pac I.
Stack display. Simply tap the card slot to turn the stack display on or off. High-contrast mode. Triple-tap the display to turn high-contrast mode on or off. High-contrast mode applies to the main display, stack display and register display. Use the settings to define your preferred mode. Full-screen program editing. Tap display in W/PRGM mode. Easy access to program instructions and description. Swipe display right to see program instructions. Swipe right again to see the program description. paste it into the appropriate field in the card manager. No Turbo mode. Unneeded since registers do not get updated until they're visible. No "Convert from HP-97" switch, so HP-97 listings can't be converted automatically. Of course, you can still import HP-97 program cards. The equivalent selling prices, in 2014, would be $1,900 (HP-67) and $3,200 (HP-97). Note: Version numbers after the slash refer to RPN-67 SD (from 2018) or to RPN-97 Pro (before 2015). Early RPN-67 SD versions up to v2.3 are listed at the bottom.